March 28, 2014: By the time you finish reading this story, you'll be about 1,000 km closer to the planet Mars. Earth and Mars are converging for a close encounter. As March gives way to April, the distance between the two planets is shrinking by about 300 km every minute. When the convergence ends in mid-April, the gulf between Earth and Mars will have narrowed to only 92 million km--a small number on the vast scale of the solar system. 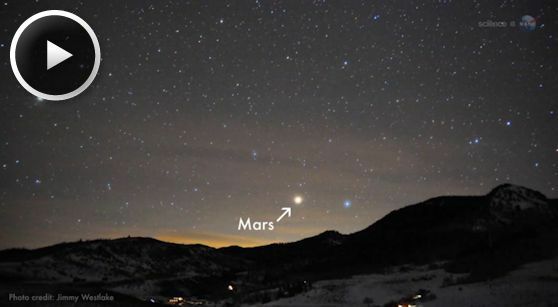 Astronomers call this event an "opposition of Mars" because Mars and the Sun are on opposite sides of the sky. Mars rises in the east at sunset, and soars almost overhead at midnight, shining burnt-orange almost 10 times brighter than a 1st magnitude star. A new ScienceCast video previews the April 2014 close approach of Mars. Play it! Oppositions of Mars happen every 26 months. Of a similar encounter in the 19th century, astronomer Percival Lowell wrote that "[Mars] blazes forth against the dark background of space with a splendor that outshines Sirius and rivals the giant Jupiter himself." In other words, it's really easy to see. If the orbits of Mars and Earth were perfectly circular, April 8th would also be the date of closest approach. However, planetary orbits are elliptical--that is, slightly egg-shaped--so the actual date of closest approach doesn't come until almost a week later. On April 14th, Earth and Mars are at their minimum distance: 92 million km, a 6+ month flight for NASA's speediest rockets. You won't have any trouble finding Mars on this night. The full Moon will be gliding by the Red Planet in the constellation Virgo, providing a can't-miss "landmark" in the midnight sky. Remarkably, on the same night that Mars is closest to Earth, there will be a total lunar eclipse. The full Moon of April 14-15 will turn as red as the Red Planet itself. A video from Science@NASA has the details. Although these dates are special, any clear night in April is a good time to look at Mars. It will be easy to see with the unaided eye even from brightly-lit cities. With a modest backyard telescope, you can view the rusty disk of Mars as well as the planet's evaporating north polar cap, which has been tipped toward the sun since Martian summer began in February. 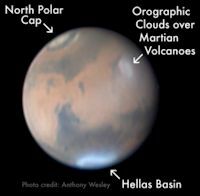 Experienced astro-photographers using state-of-the-art digital cameras can tease out even more—for example, dust storms, orographic clouds over Martian volcanoes, and icy fogs in the great Hellas impact basin. The view has been described by some observers as "Hubblesque." Update: You're now 1000 km closer to Mars. The distances and velocities cited in this story were calculated by JPL's online HORIZONS ephemeris. All velocities are correct for March 31, 2014. Because planetary orbits are elliptical, not all oppositions are the same. In 2003, Mars made its closest approach to Earth in 50,000 years, an apparition that mesmerized sky watchers all over the world. The 2014 opposition of Mars is a much more "run-of-the-mill" opposition--not historic, but beautiful nonetheless.